We hear statements like these from politicians and their spin doctors. This election is the most important in the nation’s history. We’ve put an end to senseless spending. Raising taxes will only stop the job creators. I hope you laugh when you hear these. If you aren’t at least smirking, then you have too much skin in the political game. They contain portions of truth. Politico this morning has a piece on Speaker John Boehner’s new Chief of Staff and the effects on the remainder of this Congressional session and the lame duck session after the elections. It might be a little too inside politics for most of you. But there was a curious paragraph at the end of the story about Boehner’s lack of success. In a world without earmarks, and with a leadership unwilling to take punitive action, Boehner has found it difficult to rally his lawmakers behind a position. So the Speaker has lost his most important weapon – earmarks? That’s the cause for the stalemate in Congress? We’re blaming it on pork? Do we really have a world without earmarks? Technically, earmarks are gone. A lawmaker caught slipping in an unauthorized goodie for his state or district gets ridiculed by both parties. But in reality, we have plenty of earmarks – in different forms. Look at the House Subcommittee that passed a new FCC rule favoring the broadcasting industry so SuperPacs can dodge transparency on campaign donations. That’s a major give-back for all the bribery money offered from the broadcast lobby. Media bias alert: I bet no network or cable news reported on that. If you have seen a piece, send it to me. 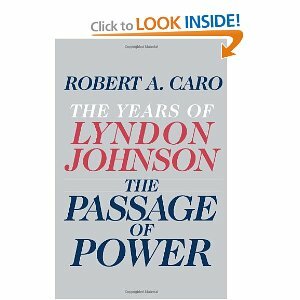 I just finished reading Passage of Power by Robert Caro, his latest tome on LBJ. It offers a great look back at some of the legislation that we have today like Medicare, the Civil Rights Act, and what was LBJ’s War on Poverty. And these are laws and programs that have brought great benefits, but also part of the fiscal pain we’re enduring now. Some highlights from the book as it correlates to today’s political and economic landscape. LBJ faced an intransigent Congress back then. In the weeks leading up to and after JFK’s assassination, that Congress also had a do-nothing tag similar to Truman’s in 1948 and today. LBJ claimed huge political successes thanks to his use of pork give-backs. To get lawmakers to vote his way and push the laws to passage, Johnson built huge NASA offices and research centers and he promised a cut in federal spending to Virginia’s Senator Harry Byrd, today’s Tom Coburn-like deficit hawk, all while he was passing JFK’s tax-cuts. Corporate and special interest money was just as rampant then as it is today. LBJ lived off the oil industry from Texas for his campaigns. There is far more money today to legally bribe lawmakers. Most Americans, including the Supreme Court, regard campaign bribery today as just “doing business”. Since the coffers of government are dwindling, politicians have to fulfill their power and addictions by shifting to the greater and remaining source of political crack. And special interests and the media are lining up. They realize this is not an expense, but an investment. Another big difference is that we live in a totally different world from the 1960s. Demographics: we are a graying society; in the 1960s the earliest boomers were just getting into college. Today baby-boomers are retiring in droves. That means our largest population is no longer working. Plus, they’re older placing massive burdens on Social Security and Medicare – that mathematically cannot continue without massive changes. Technology: post-World War II helped many people find new jobs. Today we can do more efficiently without more workers. Many jobs – from the 60s, 70s, and 80s — have gone and won’t come back; they don’t exist. Watch shows from the 1960s. They had plenty of secretaries back then. Not now; secretaries are replaced by smart phones and computer software. Developing World: Thanks to technology and communications advances, the Third World, as we knew it in the 1960s, is now gaining economic ground. They can do what we did for less. You can see it in China now too. They’re workers have now advanced where they want more pay and better benefits which is leading to China losing jobs to other developing countries. Ironically, some of those jobs are coming back here to the US because it now makes more economic sense since China’s costs have risen. Who do you blame for this lack of awareness to the world around us? Republicans and Democrats? Sure. But they’re really just a symptom, not the cause. Both parties have gobbled on troughs of pork to get themelves re-elected for decades and even centuries. The Tea Party? Not really. Again, they’re just a symptom. In defense of them, they’re really the first political movement that is looking ahead to the financial future. 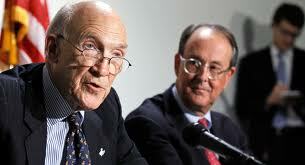 Granted, they’re backwards on social issues and they seem to be backed by myopic billionaires like the Koch brothers. But it’s hard to deny the Tea Party logic. So many lawmakers over the decades — from both parties — never pulled back the government spending during good times. The good times were an excuse for politicians to create their legacies or fiefdoms. How about yourself? That’s a big yes. We failed to see the finite nature of the economy and our so-called greatness. We allowed the politicians to tell us and give us what made us feel good and we kept electing them. W got fat, happy, and stupid. The media? In some ways, I would say yes. The media – especially the broadcasters – have a responsibility to bring us safe and credible information. Instead, they use our airwaves for easy, simple entertainment fare that passes for news. I’m tired of hearing a news anchor lead a newscast with “Shocking news tonight” about something that is far from shocking. Yes, I tried to rewrite that crap, but was accused of being boring. But blaming the media is too easy. Really, the media is just a business. They started making a lot of money and to make even more money, they gave gobs of legal bribes to pay lawmakers. But that comes back to us – you and me. We sat and allowed the media to fill us with entertainment, rather than real news. You don’t have to look too far in our past. We elected George W. Bush based on the fact he seemed like a nice guy at a barbecue. He then squandered a massive budget surplus by plunging us into two wars while cutting taxes. By the way, he was the only president to have a business degree and ran a business. We were shocked (oh that word again) at 9-11 when the threats from Osama bin Laden were very evident long before the attacks. The financial crisis and the housing bubble burst were inevitable. But the media and our politicians believed we had entered an age of perpetual prosperity. We fail to see what is happening outside our borders. So, many of us were dumbfounded at the way technology and communications are making small countries just as economically viable as we are – and they can take our jobs. We concentrate on protecting the 20th Century technologies for production, energy, and communications while foregoing a long-term path for economic strength. Why are we one of the worst countries when it comes to being wired for the Internet? Look at media companies like Comcast and their vast lobbying efforts and its ability to control both production of shows and the delivery of shows. It’s no different from Standard Oil or the railroad barons. We receive a credible solution to our fiscal crisis, the Simpson-Bowles Plan, and politicians – namely President Obama — table it until after the election.